The third floor of Waldo Hall is known to be haunted by a female ghost. It was built in 1907 originally as a women's dorm. Today it is the Academic Success Center at OSU. I made this oil painting a few weeks ago and forgot to post it. It is 12X16 and will be included in a future collection of coast or bridge images. If I don't sell some pictures soon I will no longer be able to move around my studio. This is one of the oldest buildings on the OSU campus. I will include it in my OSU collection. 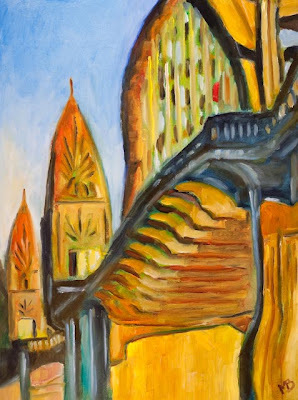 It is a 12X16 oil painting. 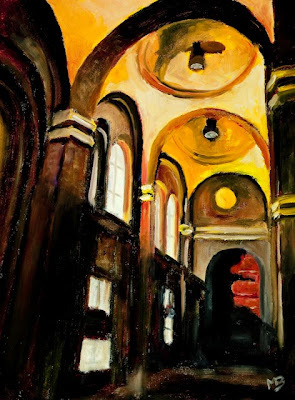 I found this scene one night just before the Open Figure Studio session at Fairbanks hall which is right next door. 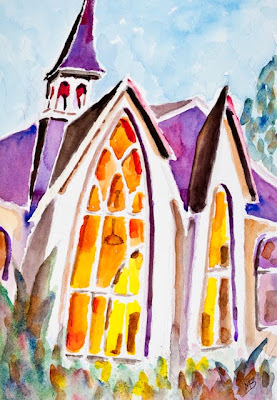 This is a caracature of the Corvallis Arts Center which at one time was a church. I recently created this image while working at the Art In The Valley Gallery, a good way to spend my time. 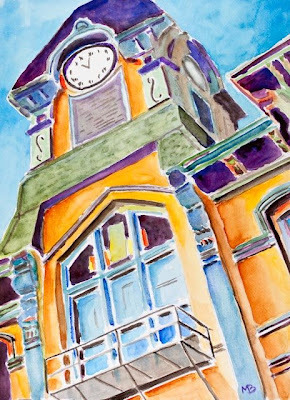 This painting will be part of a set I am doing on Corvallis. It is a 7X10 watercolor. 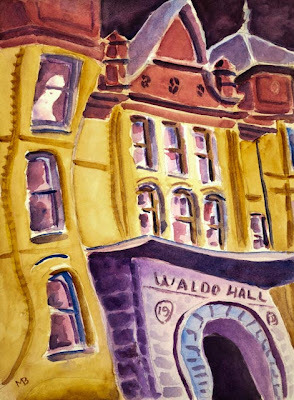 This watercolor of Benton Hall is another in my series on the historical architecture of the OSU campus in Corvallis, OR. This was the first building on the 39 acre campus (for $25,000 in 1887) of the original state agricultural college. A working clock in the clock tower was not added until 1988. Before that it was just a drawing of a clock face. Strange but true. Today it is the home of the Department of Music. I took the liberty of adding the cello "f holes" on the sides of the tower. 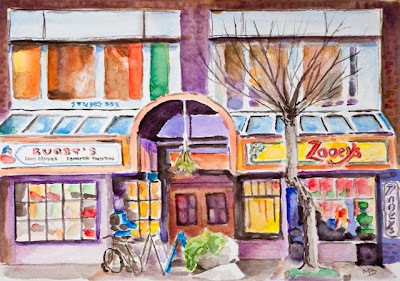 This is a watercolor painting of Zooey's in Corvallis. I don't know exactly what they sell but I liked the colorful building which sits next to the Whiteside Theatre. I will include this image in my Corvallis collection. 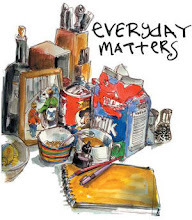 Lately I have been making one or two paintings a week, usually alternating between watercolor and oil. This is Weatherford Hall at OSU in Corvallis. 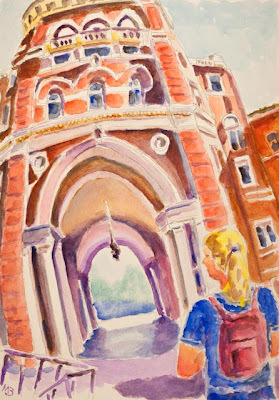 I am now developing a series of watercolor paintings representing the historical buildings on campus. I hope to end up with a set of 5 for notecards, etc.